Engagement sessions have come a long way in the last ten years. Once, there were stiff formal portraits taken for newspaper announcements. Now they are a way to celebrate and remember those exciting days leading up to your wedding. Most couples put a lot of thought into which location they would like as their background for their photos in the District or the outfits they want to wear. A new consideration is whether you want to include your dog. Let's be real, a dog isn't just a pet, it's family. 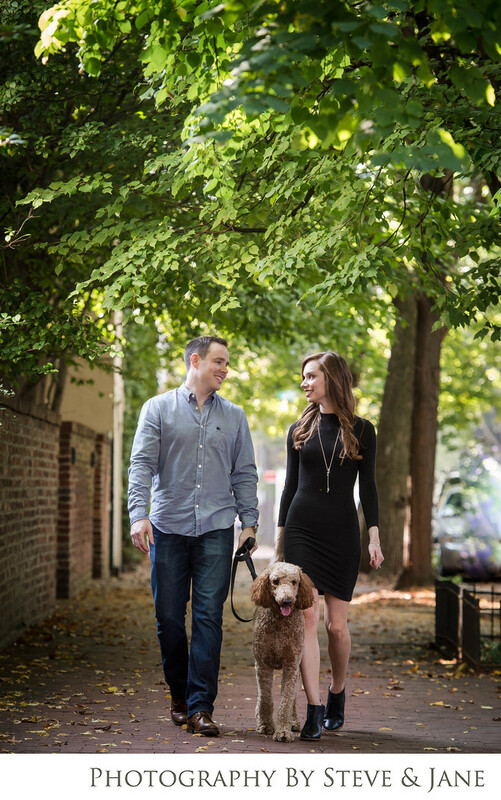 We love it when couples include their pets into their session. But there are a few things to keep in mind. Do you want the dog in all the photos? If you only want your dog in a few photos, bring along a family member or friend that can take the dog when he isn't in the photo. Some couples do a few photos with their furry friend at the beginning and then send the dog home with the wrangler. Others stay for the entire session so the dog can be a part of each part of the session. Does the dog get along well with others? If your dog is a little rambunctious, you might not get a perfectly posed shot with everyone, including the dog, looking at the camera. But you could get some fun shots playing with him. Does the dog shed and are you wearing dark clothes? If the dog sheds, you will want to make sure you bring along a lint roller. Is it a hot day? Even if the session is just an hour, dogs can get easily overheated. Bring along some water! Treats can help the dog focus. If you want to try for some of the photos with the dog looking at the camera, a treat is a great way to get their attention. We hold the treat, everyone looks at the camera, and then the dog gets the treat! Win for everyone! If you are looking for a photographer that is dog (and other pet) friendly, we are your photographer! Looking forward to capturing you and your dog for your photos! Location: 2715 Q St NW, Washington, DC 20007.